In 2008, Channel 31 asked us to present a series of late night cult movies on Saturday Nights. We claimed we had plans on Saturdays, but they called our bluff and so we presented three seasons of cult movies, from The Lady Vanishes to Santa Claus vs the Martians. 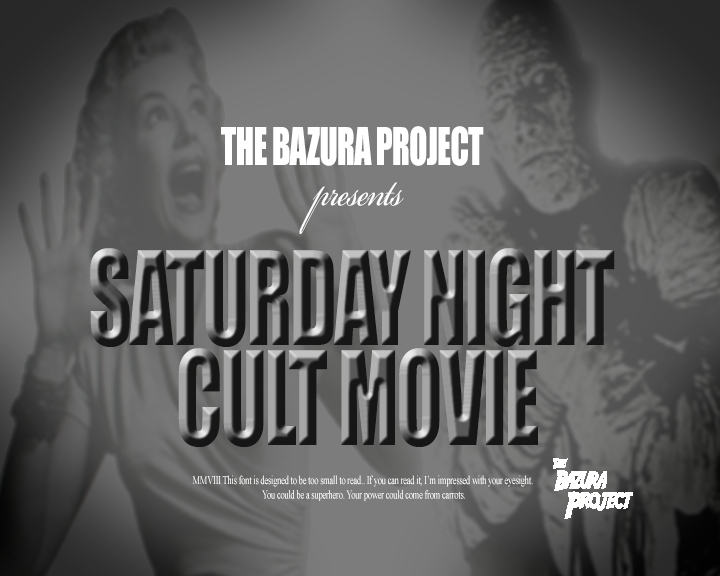 In the third season, we moved to Thursday nights but continued to call the show Saturday Night Cult Movies because we always remain true to our roots, even at the expense of confusing the audience. Here, for the benefit of completionists only, are all 39 openings we recorded for the series. One of these intros is for our very favourite film. Can you guess which it is? Carol Lombard puts modern comedians to shame in Nothing Sacred. Arguably the funniest romantic comedy of all time, His Girl Friday, gets the Bazura-introducing-it treatment. Come with us as we ride in the whirlwind. Inspired by the title of his latest film, Rex Harrison catches the night train to Munich. Margaret Lockwood goes searching for a vanished lady in Alfred Hitchcock’s Family Plot! No, wait. The Lady Vanishes. That’s it. Have the kind of fun you can only have when you’re too young to know any better with Incoming Freshmen. Buster Keaton creates one of the greatest comedies of all time with The General. Santa Claus faces his greatest (and perhaps only) challenge yet in Santa Claus Conquers the Martians. Stanley Donen channels Alfred Hitchcock in tonight’s film Charade. A love story featuring a cast of pigeons. Nothing we say in this intro is made up. Swear.